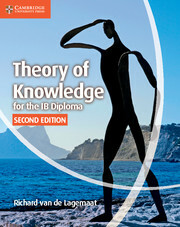 Written by experienced practitioners this resource for Theory of Knowledge for the IB Diploma offers comprehensive coverage of and support for the new subject guide. 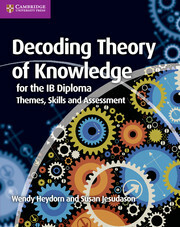 Decoding Theory of Knowledge (ToK) is an accessible new resource that explores Areas of Knowledge, Ways of Knowing, Personal and Shared Knowledge, the Knowledge Framework and Knowledge Questions. Written in succinct and clear language, this engaging book decodes ToK concepts and helps students develop their critical thinking skills. The book offers extensive support on the new assessment criteria for the essay and presentation. Features include explanation of key concepts to consolidate knowledge and understanding; real-life situations to engage students; practical activities to develop students’ thinking, writing and presentation skills; and top tips to provide further guidance and advice.